The Energy Regulation Board (ERB) has reduced the pump price of all petroleum products effective Tuesday midnight tonight. Professor Yamba further announced that diesel has seen a reduction and will be selling at K10.70 from K 11. 40. He said the price of Kerosene has been reduced by K1.22 and will be selling at K6.81 from K8.03. Low Sulphur Diesel has also seen a reduction of 68 ngwee and will be selling at 13.01 from 13 .69. 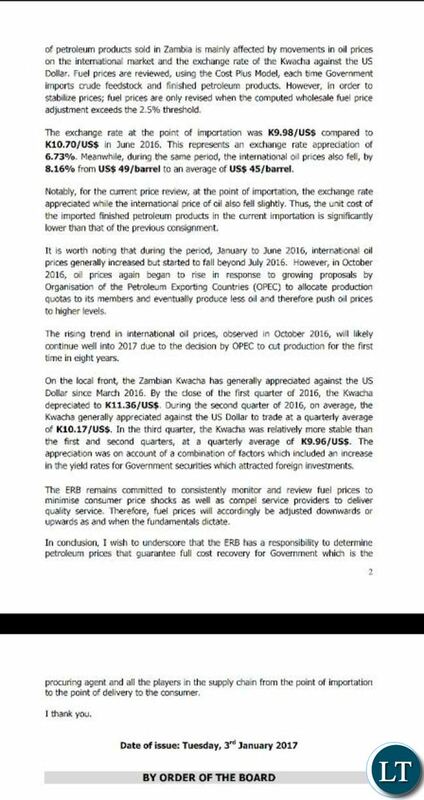 He added that ERB will continue to monitor and review the pump prices according to the minimised consumer shocks. Professor Yamba was speaking at a media briefing in Lusaka. Hahaha.. PF has lost it… sudden increases and reduces. You don’t run the economy in this way. We are doomed! Flip flop, chipante pante, government in motion. They first increase the commodity prices then they reduce, their leader first increases his salary three times then announces that he has cut it by half, so that the gullible, illiterate majority Zambians can think they are a listening government. Ba swine! A very difficult govt to understand. ERB has reduced the price because ECL instructed them to do so in his New Year’s message. The increase is coming soon and it will be by K5. How do you run the economy then? The oil price fluctuates in most countries and when it does so in Zambia something must be wrong? Bati kwana ba PF nabo na professor bamupanga icupuba? Uyu Professsor walifye bwino nembabula shakwe. He looks old he should retire, we need young leadership.. Thats why they cant even fight for cheaper fuel. they have their own interests. It is amazing that we have !d!ots who seem to be living abroad (owing to the flags on their avatars) yet their comments seem so shallow! Those who have lived, or are still living abroad (like the USA, Canada, and many countries in Europe) would testify to the fact that Fuel/oil prices fluctuate all the time. I have personally witnessed prices of fuel change two to three times in a day. I am not an economist, but fuel prices in certain countries is left to FLOAT (fluctuate) the same way CURRENCE (money) floats. Try being rigid with fuel prices and you will end up like Venezuela despite it being an Oil producing country. Please people, get a grip even if it is in your DNA to criticize Govt all the time! This is the work of a hardworking government which is pro poor. Other miserable quacks like Hap Hazard (HH) Kaponya are busy praying to Satan for the economy to crash so that they gain cheap political mileage. This is a good announcement ERB. Kudos! Shame the critics. The up down party haters with their U5 and GBV are still suffering from Chikonko mwikate. 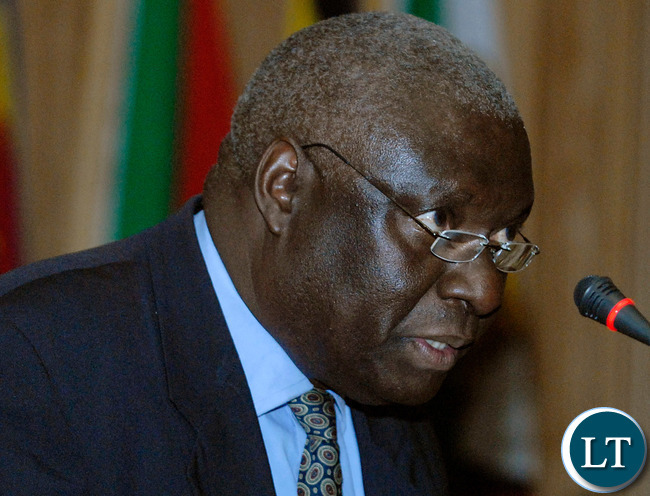 The strengthening kwacha and fall in oil prices? Oil has been steadily rising. Who are they trying to fool? A government of people with chicken brains. Only people with retarded brains like kudos would get excited by this. What fundamentals? The strengthening of the Kwacha as compared to the rise of crude oil price, the delta between the two can not lead to a decrease unless am missing something… oil today is at $57. TheEngineer (Australia now Germany you are right. Now its at $58. Am really wondering which fundamentals this professor is talking about. Copper is now treading $ 5535.00. Oh, so they should have left it where it was? Yes, they should have left it as it was. ERB has just fixed a knote in its neck…a paradoxical move! A sensible citizen must maintain their budget …next increament to be effected in the next two months. That doesn’t matter, as long as there a a corresponding decrease as soon as the crude oil price drops again. This up and down price adjustment happens even more frequently in developed countries. Stop living in your small world. The increase is coming soon and it will be more than the decrease… The ultimate is to increase the price even further than where it was yesterday. Everyone seems to be happy now (today) due to the decrease and they will not complain when there is an increase, it is that simple. The reduction is welcome very much. But alas the price is still too high. The average price of a barrel of crude oil for the last 12 months in 2016 is as follows. – DEC $ 50 (Average to be confirmed as data not to be ratfied), but most of December crude was just above $50-00. If you look at the Kwacha in the last 12 Months, the increase which happened before this reduction completely does not make sense. Do your maths. i totally agree with you mwansa . besides the adjustment is nothing it only fools pf cadres who cant see anything, soon something worse is coming indeed zambians are beeing taken for a ride. But Yamba is aesthetically unpleasant to the eye, Apuu! Of what importance is his appearance to anybody here? If you have been brainwashed by muzungu about European standard of beauty..please keep it to your silly self!! Why? To your eye may be? Really laughable …its shambles everywhere with these empty tins..when price was at all time low they were increasing…what fundamentals surely?? Meanwhile in other news TV levy increased from K3 to K30. you will only fill it when you go to buy electricity units. The up down party haters with their U5 and GBV are still suffering from Chikonko mwikate. Sela tubombeko! The wrong reason was used when they last increased and now because of that, any further increase in oil will end with the need to subsidize. Prof is not making sense and only trying to put flesh on a bones. Prof. Yamba is too dignified, important and professional to allow himself to be abused by people in government who are, honestly, dishonest and are common petty crooks. Then why is peddling lies on behalf of the Government? This reduction would have made a slight difference if airtime and water tariffs did not rise. It is a mockery. Minister of Agriculture, Irrigation and Water Development George Thapatula Chaponda, has refused to resign after the Zambian maize procurement saga appeared to link him to the deal. Due to the the volatility of the kwacha to the United States dollar the prices hiked. Now with the stability of it and the common grounds reached, I can safely say the move is welcomed. Nothing political of whatsoever. i said in due course sounded like an instruction and i was wright…. Crude oil prices have been falling for 4 years, how then have the prices of petroleum products in Zambia not gone down. And the bus operators will just sit back and act like nothing has happened. Jump you are so right, nothing makes sense in this country. There is no ripple effect with issues. The so called Ministers & MP’s are so complacent. Where is the CEO of ERB who is the technocrat not commenting on this issue? Zambian fuel was overpriced, and we all know that there are too many hoodlums in the fuel pricing ring involved in milking Zambians! Ba ERB Kalulushi is still selling fuel at 13.70 claiming you have not sent someone to change the meters. Petrol stations have not reduced the fuel prices in chingola since morning and most people were astonished by their traditional violation of the law. It is only during increases that Chingola fuel stations abide to announcements but during decreases they wait for someone to come over and switch the price. Is this the way we are going to operating as a country in this new age? Is it a new norm supported by ERB? I suspect the pumps at most filling stations country wide are not calibrated thus a lot of theft is going on in this industry. I am about to get a court order to compel Kalulushi Filling station to comply. The phuckers don’t waste time when it’s increasing involved.